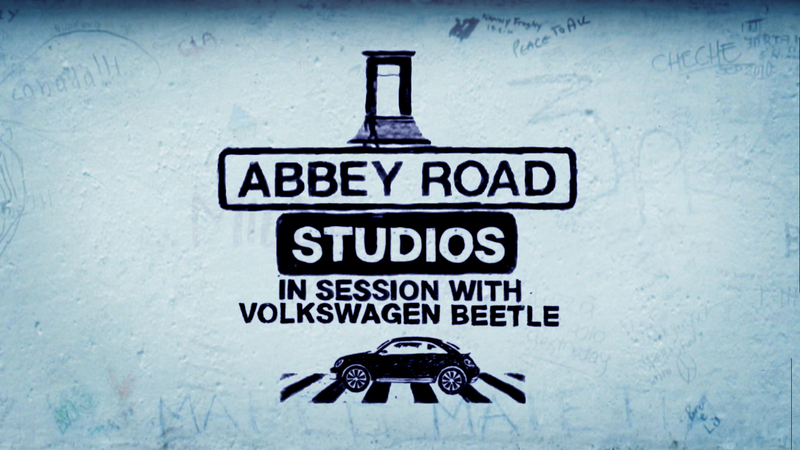 We’re currently two shows in to our new series of Abbey Road Studios: In Session with Volkswagen Beetle, an 8-part music show on Channel 4 that we’re editing on Adobe Premiere. This week I’m going to talk about some of the features in Premiere, and what it’s like to cut a broadcast show with. The main advantage to our workflow using Premiere CS6 is the ability to edit natively. On previous seasons we’ve converted camera originals to Pro Res in order to be able to edit with them on Final Cut Pro 7. This has a number of disadvantages. Firstly the time it takes means we could never edit immediately – there was always the tiresome task of transcoding rushes via FCP’s Log and Transfer tool or MPEG Streamclip, before we could start getting creative. The combination of the Mercury Playback Engine and GPU acceleration means that Premiere can pretty much handle any footage you throw at it, without the need to transcode your rushes first. Combined with the power of the HP Z820 workstation, means it takes no time at all to import camera originals and start editing, even in multi-camera mode. The majority of my business is editing work for clients in the music industry, either for broadcast or web release. I specialise in editing multi-camera performances, varying from 3 to 10 cameras, depending on the scale of the gig and the budget involved. This new show is a multi-camera performance show from Abbey Road Studios, where we film with anywhere between 4-6 cameras. We’ve been editing the series for a month now, using HPZ820s with 32GB RAM and Nvidia Quadro 6000 graphics cards, and the performance has been amazing. Running 5 streams of HD camera originals, we’ve experienced no lags or crashes – the machines just handle it incredibly well. I’ve worked with up to 6 angles, and also had 3 takes with 6 angles each, layered on top of each other, and I’m still experiencing smooth playback. All at full resolution. I haven’t had a chance to push things beyond 6 angles so far, but I have full confidence it will run fine, based on what I’ve seen so far. We also have an HP Z1, which I’ve stated in previous posts was primarily intended to be used as a DIT workstation on set. This machine has been the surprise package in our set-up. My junior editor Darren Martin has been using this as an additional edit station, cutting 5 streams of multicam in full resolution without any problems. We seem to be lucky that our average shoot involves 5 cameras, as the first time we tried to edit with 6 on the Z1, it started to experience problems with playback. But anything up to 5 and this machine performs amazingly well. Even more surprising is that it can handle this all running from a USB 3 drive. Now, I should point out that we generally don’t edit from external drives, but the fact is that we can if we need to. This means if there is a break in filming, we could plug a rushes drive in to the Z1 and start editing. It’s a great option to have. So beyond the technical capabilities, what’s it like cutting multi-camera footage in Premiere? Well, if you like multicam editing in FCP 7, I can only say that Premiere is just as good and a whole lot easier to set up. For me FCP 7 always fell down when you tried to multicam with non-continuous clips. By that I mean, occasionally we’re supplied with rushes from a concert or performance where camera ops start and stop. Obviously this is not ideal, but it happens. Sometimes it’s down to file size limits in DSLRs, other times it’s operator mistakes. Several times I’ve been supplied 2-hour concerts with each camera feed spread out over several non-continuous files, and these were always a real challenge to make multiclips from in FCP 7, with gaps in the sync timeline. I would have to blade clips into segments and make several individual multiclips. Another time drain before I could get started editing. Our process using Premiere is as follows. We drop the 5 individual camera feeds into a timeline, layered on top of each other, making sure to check there is camera audio on all of the feeds. Under that we drop in the audio mix. We then run Plural Eyes on the whole session, which automatically syncs the 5 angles and the mix audio. On some jobs all the camera feeds are synced via external timecode, so Plural Eyes is not necessary, however, some cameras, including the DSLRs, don’t have an input for a timecode feed. In which case Plural Eyes is your best bet for syncing files. In my experience external timecode is rarely foolproof, with normally one or more of the cameras coming back with asynchronous timecode. Another alternative is to film a digital clapperboard and modify the timecode on your files, although Premiere does not allow you to alter timecode on DSLR originals. To me the best option is always Plural Eyes. Set your timeline up and let it run while you get a coffee, and by the time you return your session is synced. After that we always double check sync on a drum hit or a hand clap to make sure it’s done the job properly. A typical Plural Eyes sync sequence in one of our projects. The best thing about Premiere is that it no longer matters if there are breaks or gaps in the timeline, as the multi-camera clip is created by first nesting all your footage. If there is a gap in the timeline, the angle just goes black until the camera feed returns. 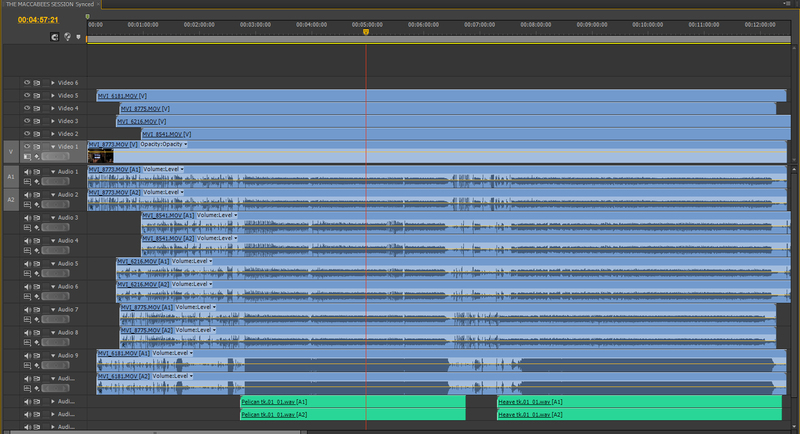 No awkward problems setting in points and pulling clips from sequences into bins before creating multiclips. After you’ve nested the sequence you simply right click on the nest in the timeline and choose Multi-Camera > Enable. In comparison to FCP 7, I think with this system we probably save around 30 minutes every time we set-up a new multi-camera session with 5 or more tracks. Add that to the hours saved by not having to transcode our footage, means that using Premiere we can hit the ground running. To begin editing you have to open the Multi-Camera Monitor, which cleverly changes display modes depending on how many angles you have in your multiclip. If it’s 4 angles, the monitor automatically opens as a 2×2 display. If it’s 6 angles, it opens as 3×3 and so on. No having to keep changing the view manually from 4 up to 9 up. This a great feature and just another level of time-consuming tasks removed from the process. The Multi-Camera Monitor resizes automatically depending on how many angles you have. Left is a 4 stream clip, right is 6 streams. On a creative point, my approach to cutting music has always been as follows. Once I’m in multi-camera mode on a music performance, I never hit stop on the playback. I’ll run the track through and make my edits using the keypad based solely on instinct – what feels right with the pace of the music, what’s my best shot, what instrument is the dominant sound in the mix at that point in time. I always try to treat it like a live edit, as although it’s recorded, it’s normally a recording of a live performance. I don’t hit stop even if I feel I’ve made a mistake – sometimes those mistakes work in the edit. That first run through is always a very rough edit, but by letting the track play I’ve gained a sense of the track as a whole. I’ve allowed myself to react instinctually to the music – a first impression that will become more and more diluted the more you watch and polish your edit. Therefore it’s important to allow that initial reaction to shape your cut at this early stage, otherwise you risk losing the spontaneity and energy of the live performance. Only after I’ve finished that first run through, do I then stop and go through fine tuning the edit with the roll tool. I may do this process as many as 5 or 6 times, until I feel like I have the best edit, after which I then watch the edit back, again not stopping playback. If I spot a mistake or a cut that just doesn’t feel right, I’ll use a marker to draw my attention to it. You always have to keep a sense of the entire track, otherwise, if you edit in sections and keep starting and stopping, you can get false impressions as to how certain cuts work. The red edit point and roll tool icon. After our initial multi-camera edit, this is how we refine our cuts. There are a few things that work differently to what you may be used to if you’re coming from FCP 7. You can’t collapse a multiclip once it’s been created, and there’s no option in the Project Manager to strip your edit down to a single angle when you’re media managing or onlining. Because the Multi-Camera Monitor window combines your multiclip and your preview in one window you have to always make sure you’re playing from the monitor and not the timeline. This can be a bit of a drag to keep having to select the monitor first or hit the play button from the monitor as opposed to the space bar. It would be great if when the monitor was open it locked sync automatically so I can play from any hotkey and see the results. Also if you’re layering up multiple takes of multi-camera material in your timeline, you have to tell the monitor, via a pop-up menu, which video track you want to see. In FCP 7 it just presumed the top level of video was the one previewing in playback, and that makes more sense to me. Finally the multi-camera view will not display on your external broadcast monitor, instead you get the results of your cuts, but not the stems themselves. That’s something I miss from FCP 7, especially when we have clients in. But while there are a few things to get used to, we’re fully aware this is a different software, so moaning about what it doesn’t do when there are so many things it does well, seems a little negative. Take for example the way once your multiclip is nested in your timeline, you can open the nest to make adjustments to sync, grading or anything else on any individual angle, and those changes will update automatically in your multiclip, even if you’ve edited the whole thing. Pretty sure FCP 7 never did that effectively. The beauty of this whole experience is that we’ve just taken up where we left off in FCP 7 by moving to Premiere CS6. The learning curve hasn’t been too steep and we’ve got a whole load of new features that mean we can work faster and save time. If you’re working in a broadcast environment and wondering if Premiere is up to the job of editing a network series, I can say categorically that it is. We have already delivered 2 shows in a pretty unforgiving schedule with relatively little panic or pressure. At this point in the last series working on FCP 7, I was struggling to meet deadlines. With Premiere, after 2 shows, I’m 2 days ahead of schedule. Over the course of the series I hope that translates into delivering the final episode a week ahead of our original schedule. I can’t think of any better endorsement for the software and hardware we’re using on this series. Note – If you’re thinking of moving to Premiere, I’d like to recommend a book that has made my own transition easier. Previously, as an Apple Certified Trainer in FCP, I’ve always relied on the Peachpit Press training manuals. However the best training book I’ve read on Premiere is An Editor’s Guide to Adobe Premiere Pro, by Richard Harrington, Robbie Carman and Jeff Greenberg. I went through the book in a week, getting to know the various elements of the software, and it made the whole experience of switching relatively painless. Richard Harrington also has a great multicamera video tutorial on Creative Cow, which helped us see Premiere’s Multi-Camera tool in action. If you’re not already, follow all these guys on twitter, along with Walter Biscardi whose company also made the switch from FCP 7 to Premiere. You can get more updates from me on twitter, by following @mylittleeyetv, or have a look at my company website at www.mylittleeye.tv. If you’re in the UK you can watch the most recent episodes of the show on 4OD’s website. If you have any questions or just want to say hello, feel free to use the comments section on this blog, or contact me directly via the website.